One of my favourite places is the Vancouver Christmas Market. It's only on for a few weeks during winter, but it's absolutely magical. It has food, Christmas/German themed everything, and more food. Oh, and there's even Santa. Our first year there we were set on trying every food and drink that was available. Cheese with more cheese? Check. Feuerzangenbowle? Check. Meats in every shape and form? Ohhhhh yeah. Check. And weird baked apple with unfamiliar drippy vanilla sauce? Um, yeah check, I guess. I hadn't eaten many baked apples before then, so I wasn't really sure what to expect. But I knew that I was close to experiencing something incredible, and just needed to experiment with it on my own before it was what I wanted. I think it's pretty safe to say I've found it. 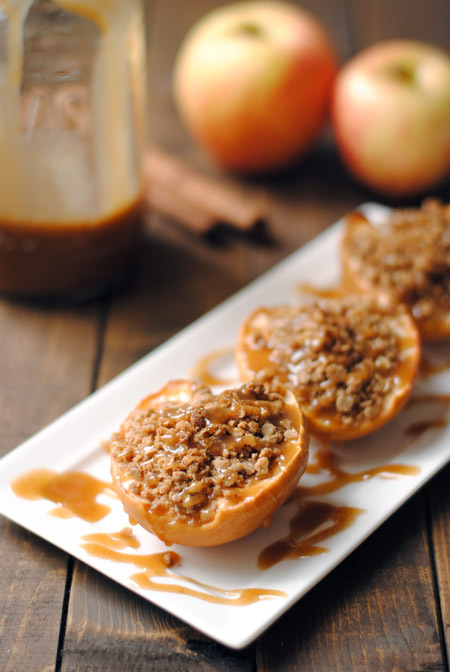 These quinoa flour and oat baked apples with caramel sauce are seriously to die for. They're a perfect way to kiss the cold weather goodbye, and gear up for fruit-filled summer dessert. The filling is reduced fat and sugar, and the sauce isn't made with heavy cream. So it's a bit lighter than some of the other recipes out there -- but it doesn't compromise on taste, at all. Want to see what else I'm baking up as it happens? Follow me on Instagram! Preheat oven to 350F. Slice the apples in half, and scoop out the core so there's a nice hollow area for your filling to sit. Bring the water to a boil, and combine the butter, sugar, flour, oats, and spices in a small bowl. Scoop the filling into the apples, packing down as needed, and place them in a shallow baking pan. Pour the boiling water into the bottom of the pan -- about half an inch to and inch deep -- and bake the apples for 30-40 minutes. They should be soft and tender. Heat all ingredients in a medium saucepan over medium heat. Bring to a rapid boil, stirring frequently, for 5 minutes. Remove from heat, and allow to cool completely before using.